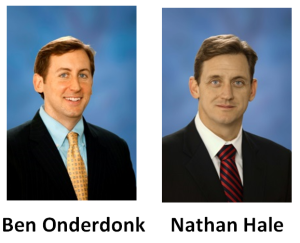 Mohr Partners, Inc., a global corporate real estate advisory firm, has promoted Ben Onderdonk, Associate Director, and Nathan Hale, CCIM, SIOR, Associate Director, to Co-Directors of Mohr’s Portfolio Account Management department in its Dallas corporate office. 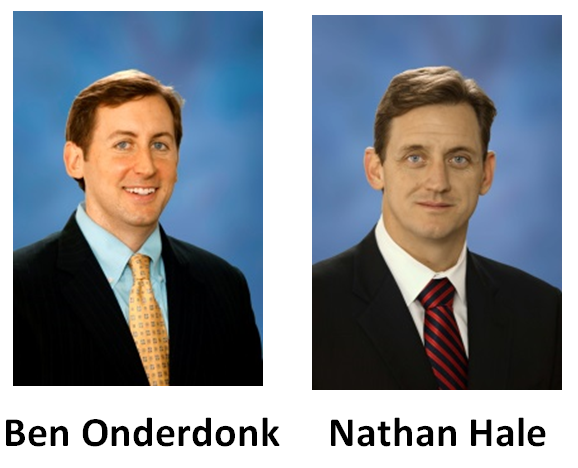 Since joining Mohr Partners in 2004, Mr. Onderdonk has completed over 480 lease transactions in 46 states and six countries totaling over 2.28 million square feet of space, managing real estate portfolios on behalf of Fortune 500 and Fortune 1000 clients. A graduate of the University of Alabama, Mr. Onderdonk began his real estate career as an Associate with Equis Corporation representing tenants. While there, Mr. Onderdonk was responsible for working on lease transactions for clients such as Today’s Office Staffing, Comark, Equus Computers, Daimler Chrysler and the United States General Services Administration. He handled the site selection and negotiations of 25 offices in five states for the GSA. Mr. Hale brings over 10 years of experience in transaction management, financial analysis, client relations and negotiations for major client accounts. He has extensive knowledge of national markets facilitating the ability to introduce creative occupancy solutions and comprehensive consulting and brokerage services. Mr. Hale manages corporate portfolios and real estate negotiations for national clients. Since joining Mohr Partners in 2008, Mr. Hale has consistently been recognized for an unmatched work ethic, excellent knowledge and ambition. To date he has managed transactions totaling more than $2 million in revenue. He was a recipient of Mohr Partners’ President’s Award in 2010 for “above-and-beyond” dedication and performance. Mr. Hale began his career in tenant representation at Fischer & Company where he represented FedEx, CitiGroup, Comcast, The United States Postal Service, A.G. Edwards and other national accounts. His duties included managing corporate portfolios by developing and executing strategic plans and negotiating real estate transactions.